NEW ORLEANS – For the sport of collegiate track & field to continue to grow, it relies heavily on a team effort – just like the sport does. While there are outstanding individual achievements, team titles wouldn’t be won without multiple individuals pulling together for the greater good. When it comes to those achievements from athletic communications staffs, they often go overlooked. But rest assured that won’t happen on our watch. 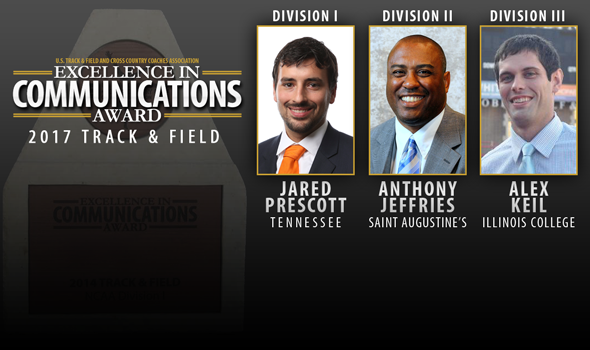 That’s why we’re pleased to announce the recipients of the Excellence in Communications Award for the 2017 track & field season as released Monday by the U.S. Track & Field and Cross Country Coaches Association (USTFCCCA): Jared Prescott of Tennessee (NCAA Division I), Anthony Jeffries of Saint Augustine’s (NCAA Division II) and Alex Keil of Illinois College (NCAA Division III). The Excellence in Communications Award recognizes those athletics communications representatives at conferences and/or schools who have committed to outstanding coverage and support of collegiate track & field. Winners were selected by the communications staff at the USTFCCCA National Office after a long nomination period. Very few athletes had a better year in collegiate track & field than Christian Coleman. Coleman rewrote the collegiate record book as he clocked times that stand as the fastest (outdoor 100), tied for the fastest (indoor 60) and 2nd fastest (indoor 200 and outdoor 200). It was after Coleman swept the short sprint titles at the 2017 NCAA Division I Indoor Track & Field Championships that his name went viral. That’s because of Jared Prescott. Knowing that the NFL Scouting Combine was on the tips of everybody’s tongue after Washington’s John Ross broke the record in the 40-yard dash, Prescott leapt into action. Prescott concocted the idea of Coleman running the 40 and from there it was a team effort with the athlete, coaches and video department. Once the video hit the Internet on May 1, it took off. Less than two weeks later, the video had more than 3.4 million views on Facebook and more than 2.3 million impressions on Twitter. It had more than six times the amount of views than any content from the Volunteer football team and made its way to SportsCenter where it was in a featured segment. Prescott churned out impressive work throughout the season on the rest of the track & field team at Tennessee and traveled to every meet, but it was what he did with Coleman following the indoor season that put him over the top and secured the honor. It’s no secret that Saint Augustine’s track & field program is a powerhouse. Having just captured its fifth-consecutive NCAA Division II Men’s Outdoor Championship, the Falcons are a force to be reckoned with. But in addition to head coach George Williams and assistant Sandy Chapman, another man has been with the program behind the scenes for the past 11 years that has helped promote the program – and the sport as a whole. Anthony Jeffries has gone above and beyond for the Falcons during his time in Raleigh, North Carolina. Despite being the lone full-time sports information employee at the school, Jeffries has devoted countless hours to featuring the school’s ultra-successful track & field program. This past year has been a busy one for Jeffries and the Falcons. With a handful of Falcons competing at the 2016 Olympic Games, Jeffries coordinated interviews with the nationally-syndicated Tom Joyner Morning Show and ESPN.com’s The Undefeated that featured Williams and his program. Additionally, Jeffries wrote a piece about the George Williams Exhibit at the City of Raleigh Museum that was published in Track & Field News. During the 2017 NCAA Division II Outdoor Championships, Jeffries took photographs and videos that were well received on social media platforms in addition to writing recaps that were featured in several media outlets, including the NCAA.com and multiple TV stations in the Raleigh market. Jeffries work didn’t stop with just the school for which he works. He also served on the CIAA Indoor and Outdoor Championships committee this season, providing recaps each day for the CIAA conference web site while covering his own program. Alex Keil took it upon himself to bridge the gap between the past, present and future. Before the 2017 campaign began, Keil compiled the all-time top-5 marks in each event for the Blueboys and Lady Blues, something that hadn’t been done as comprehensibly before. Throughout the year Keil kept fans engaged through all social media avenues (Facebook, Twitter, etc.) and created numerous videos to post on YouTube and the athletics website. What truly set Keil apart was the work he did while Illinois College hosted the 2017 Midwest Conference Indoor Track & Field Championships. Keil not only produced a program that included team rosters and much more, he brought in the man who was scheduled to announce the 2017 NCAA Division III Indoor Track & Field Championships in Naperville, Illinois.